WebWork Time Tracker is a time tracking and a screen monitoring software. Desktop tracker takes screenshots once in every 10 minute interval. Please note that you need to set the Screenshot Modes for each contract in the contract edit page. When user starts the tracker, the software starts taking random screenshots of the screen once in every 10 minutes. When the screenshot is taken user gets notified with small pop up. User can preview, zoom the screenshot, type or change the activity description and can decide whether to keep the screenshot or to delete it. Please note, if you delete the screenshot, the tracked time for that 10 minute interval will be deleted as well. Here is how will look like your Screenshot Report page with Screenshot Mode. The Tracker will work silently on the background and will not notify you whenever the screenshot is taken. This will help not to get distracted from work every 10 minutes and worry about the screenshots. After you can review your Screenshots in the Screenshot Report page. The Tracker will capture your screen exactly like with Screenshot mode, but in your Screenshot Report page the screenshots will be blurred, so user have the possibility to keep privacy of his/her work. 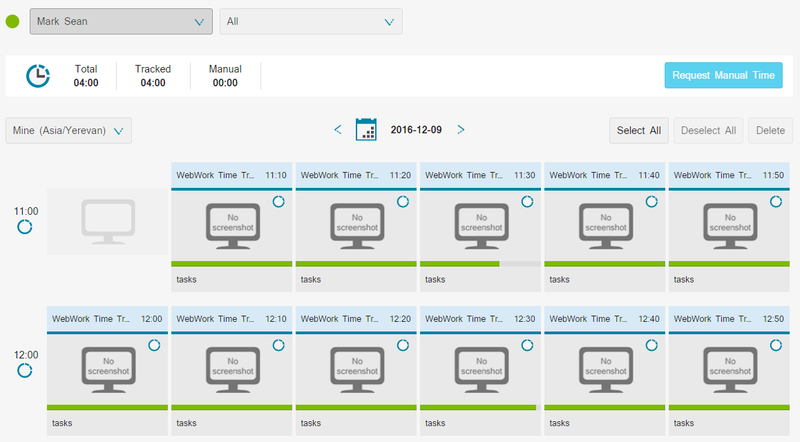 With this mode, WebWork Time Tracker will track the working hours, record the activity level, but your screen will not be captured. Screenshot Report page will look like this.